"This is a very family friendly place as well." Have a question for Villareal Heights Hotel? "Family room was spacious with 2 double beds." "Air conditioning was very welcome and worked well." "I would definitely recommend staying here and would come back." "A very family friendly place as well." Close to two excellent beaches on the island of Phuket, you are within walking distance to not only the water, but also shops and restaurants. You can arrange excursions with the hotel, from jet skiing and dive trips to golf and trekking. And if you wish to experience the nightlife of Patong, it is easy with motorbike rentals available on-site. Providing a convenience of location and amenities, Villareal Heights Hotel is sure to become a popular choice for tourists to Phuket. "We had a wonderful stay in Phuket at Hotel Villareal." Guests arriving after 08:30 PM are requested to contact the property directly prior to arrival. Whilst a bit of walk to the beach, Villareal was excellent value for money with an operator that was super helpful. The accommodation also offered access to cost price transport and activities which was a bonus. Very comfortable room, close to shops, restaurants & bars however still remained a peacefull environment. Swimming pool was clean & never crowded situated next to breakfast bar & servery. Hotel staff most helpfull & informative. the proprietors are a rarity in this small hotels, bed and breakfast business. we came to stay a few days and could not love the room and the locationmore. as things do come up in the tropics, we had to move and they could not have been more accomodating. stood behind 'customer is always right' principle and accomodated our needs even to absorb the loss, not caused by them, but to make transition easier. they were polite, correct and principled. i will recommend this bed and breakfast to anyone.. The room was modern, stylish, comfortable and quiet with all the facilities one would expect. The hotel owners were extremely warm and helpful, even personally driving me to meet my friends more than once. Close to the beach but far enough away to be quiet, this hotel is modern, comfortable and elegantly styled. What sets it apart though is the owners, who were exceedingly warm and helpful. They were genuinely interested in my comments about their hotel and facilities and nothing was too much trouble. When I inquired about getting a taxi, they drove me themselves. I highly recommend Villareal Heights Hotel. Service was very good. Hosts personable and helpful. Family room was spacious with 2 double beds. Air conditioning was very welcome and worked well. There were utensils in the family room (and kitchen sink/cupboard and refrigerator) that allowed us to keep some food on hand and beverages. Bottled water was provided each morning (as well as coffee in the room, nescafe tubes/hot water kettle). Room and beds made up each morning and room cleaned. Heated shower which worked well. Small dining table for four was helpful for a variety of other than eating activities. A fair number of electrical outlets so charging devices and batteries was easy. Wifi was good. Pool was available up the block a short walk and we used that a few times....when not walking down to the beach. The walk to the beach is not long about 10 minutes. Host advised us on getting a rental car for touring around and that was a good suggestion. We saw a lot more of the area, visited more beaches and got to some different temples and shopping sites. Renting through the host got us a good price (I know I checked several car rental places before taking our host's offer of finding us rental car). Good value. We would rent again. Thanks Phil and Jo and family and "crew"
We had a wonderful stay in Phuket at Hotel Villareal. Even though this hotel is not on the beach but we we actually preferred this because it was quiet and not as congested. Phil was extremely helpful and knowledgeable about what things to do, where to eat, etc. He went out of his way to arrange ferry tickets to Phi Phi Islands and transportation to and from the pier on a very short notice. You could just get to Phuket and leave the rest to Phil, who'll be more than happy to help you out in whatever way possible. A very family friendly place as well. I would definitely recommend staying here and would come back. We had a wonderful week in Phuket at the Hotel Villareal. Note if you stay here make sure to have them pick you up as it will be hard for a taxi to find this location, especially if you get in after dark. This hotel is not on the beach but is a quick walk to the beach. We actually preferred this because it was quiet and not as congested. Phil and Jo are extremely helpful and knowledgeable about things to do, where to eat, etc. and Jo makes the absolute best coffee on the island. This is a very family friendly place as well. I would definitely recommend staying here and would come back. Love the initiative of the owner to drive us around to show us some of the recommended food places and areas to go. Booked our island trips from the owner as well as it was the same price as booking ourselves. Room was really big for the price, highly recommended if you wish to stay away from the busy patong beach or phuket town. 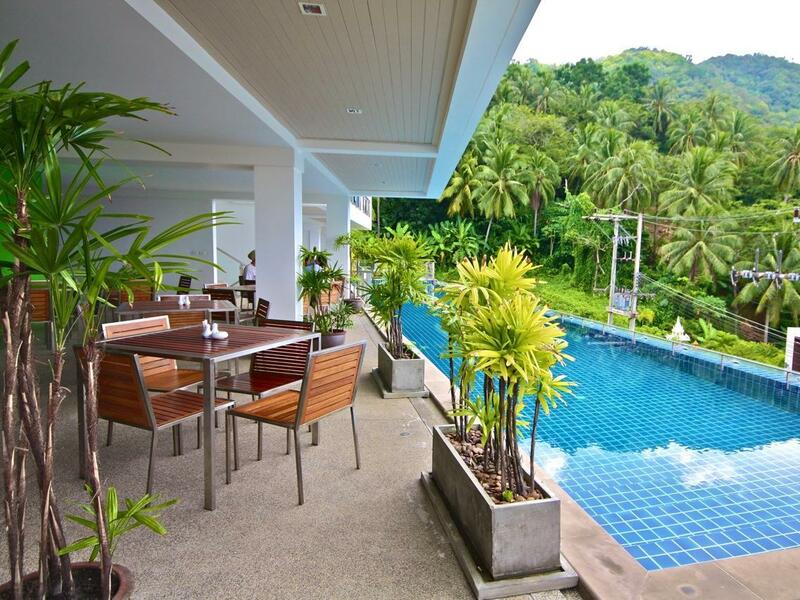 I was looking for a place away from the crowds when I stumbled upon Villareal Heights in Kata. The reviews were raving about this place so I decided to stay here. I wasn't disappointed. One of the owners, Phil, took my family and I around town to show his favorite spots and even treated us to drinks. He, his wife Jo, and Beverly were friendly. I've never quite experienced hospitality like this before so it was nice. Pros: -Value: Reasonably priced and good for travelers on a budget or want to save money -Quality: Family Studio room was spacious and very clean. Had a microwave and fridge and a basement bathroom. -Hospitality: Like I mentioned, Phil is a pretty cool guy. He and Jo seem to go out of there way to talk to guests and make them feel comfortable. Atmosphere: Nice and quiet Cons: -Location: It's tucked away on a small street and it can be hard to find when arriving. Because it's in Kata, you'll also expect to pay around 900 baht or more to take transportation to get there. Good for those who want a quiet stay. -Non-Thai: Not really a con for me and my family since we speak English but the owners and staff are not Thai and that may be an issue for Thai visitors or those wanting a more "Thai experience". The staff were incredibly helpful, we had a fantastic room which was clean and spacious and there was a lovely pool which had a great view. Our stay at this hotel was a really good experience. The staff helped us with everything we needed, from ensuring that we got good value for money, providing sound advice about getting around and organizing a rented car for us. Everything was very efficient and friendly and I would definitely stay here again. Great place to stay with amazing personal assistance from the owners. Awesome wifi and love the soft comfy beds (so much nicer than the normal hard Thai beds at most hotels). The owner went above any beyond - even showed me around town and the best places to eat and get massages and even arranged free transport! Rooms have nice big fridge. Also there is a big DVD collection to choose from for movie watching. Location is about 15-20 min walk to Kata Beach. 20-25 min walk to Karon Beach. We stayed 4 nights in the Villareal Heights and enjoyed it a lot. The room was quite big, the staff very friendly and helpful and it was pretty close to Kata and Karon beach. They recomendet us s great restaurant nearby which we visited every night. The taxi driver that we hailed at the airport did not know where the hotel was at first so that was a bit stressful. But from the moment we arrived until we left a week later, the hotel staff (Phil, Jo, and Diane) made our stay one of the most memorable in Phuket. Phil, who’s British, was great in introducing the area to us when he personally took us around town. He also helped us get breakfast just down the street. We got an upgrade on our room to one that has view of the mountains and the courtyard/road but noise was never a problem even with road traffic nearby. The room was spacious, clean and comfortable with daily maintenance and good internet. The friendly staff went well beyond expectations to make sure we felt at home. They suggested restaurants and places to go. They gave honest suggestions on day tours. It’s totally true: you get what you pay for! Then they did all the bookings so we had no hassle at all. The hotel is about 15 minutes from the beach by foot which is great since it makes for a nice walk after delicious meals! When they booked our taxi back to the airport, we felt sad to leave such a nice and friendly place. We will definitely be staying here if we are ever in Phuket. Highly recommended! Right when we arrived the owner and his staff gave us a warm welcome, a beer, and a personal tour of the town so we knew where we were. Amazing. My boyfriend and I had a fantastic stay. My only complaint is that it was too short. We were a close walk to the beach and there were restaurants and shopping the entire walk there. The owner of the hotel gave us a lot of good information about where to eat and what to do. They can help you plan tours and excursions in the area. We left on Christmas Day and one of the staff members even gave us an ornament to take with us. The customer service here was better than any hotel I stayed at in my two weeks in Thailand. Nice stay for one night on route to the airport. Staff helped us with transport and directions to the best local restaurants. Walking distance to bars and restaurants. Clean, comfortable room. Great value.